Amalgamation of blood from two human beings can lead to blood clumping or agglutination. The clumped red cells can crack and cause toxic reactions resulting in fatal consequences. In 1901, Austrian Karl Landsteiner discovered human blood groups that made the blood transfusions safe, previously the transfer of blood or blood components into a person’s blood stream resulted in many deaths. Blood transports oxygen to various parts of the body. An adult human has about 4–6 liters of blood circulating in the body. Antigen is a substance, usually a protein, on the surface of a cell or bacterium that stimulates the production of an antibody. A protein produced by B cells in the body in response to the presence of an antigen, e.g. a bacterium or virus. 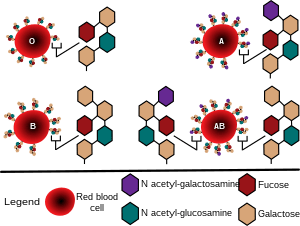 Antibodies are a primary form of immune response in resistance to disease and act by attaching itself to a foreign antigen and weakening or destroying it. The most recognized and medically significant blood types are in the ABO group. There are four principal types having two antigens and two antibodies that are mostly responsible for the ABO types. The specific combination of these four components determines an individual’s type in most cases. In 1910, scientists proved that parents inherit the RBCs antigens and that the A and B antigens are inherited co-dominantly over O.